Of course, if I was going to be serious about this, there was only one person I could turn to: the lady who wrote the book on ghostwriting. I had seen Kelly James-Enger’s name here and there throughout the Twittersphere, and knew her as someone who created helpful how-to content for other freelance writers. I had also started reading her column in The Writer magazine. 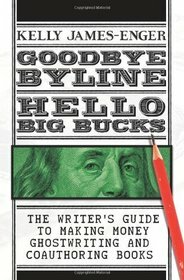 When I realized she’d written the book on ghostwriting — Goodbye Byline, Hello Big Bucks: The Writer’s Guide to Making Money Ghostwriting and Coauthoring Books — I knew it was bound to provide valuable insight into an area of freelance writing I had not yet fully explored. descriptions of the types of clients who typically need ghostwriters or coauthors, and how to target them. what to ask a possible client before negotiating your price, and signing on to the project. what should be included in the ghostwriting contract. actual examples of ghostwriting contracts. stories, tips, and examples from other ghostwriters. By the end, it had earned a spot on my permanent writer’s reference shelf (which, at the moment, is a tiny drawer in my tiny desk; sigh). And for those of you still on the fence about ghostwriting? Those of you who are still wondering if ghostwriting is a tool you should have in your freelance toolbox? James-Enger even includes a quiz to help you figure out whether or not this type of work is the right choice for you.